Health care providers play a key role in reducing their patients' exposures to unnecessary radiation. With the rate of medical imaging and related radiation exposure increasing, it is even more crucial to reduce radiation exposure from other sources, including radon. By inserting the link code below in your website or marketing emails, you can encourage others to learn more about reducing their radon exposure. 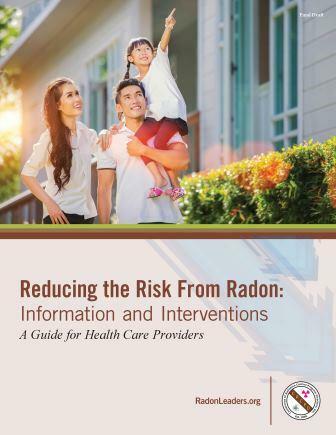 The Reducing the Risk From Radon: Information and Interventions widget will appear on your website or in your email as an image and will help introduce others to this resource. To include the widget in your online communications, copy the HTML code below and paste in the appropriate area for display. If you would like the image to appear larger or smaller, change the width and height properties to suit your needs. The native image is 1200 x 900 pixels and cannot be increased beyond that size. Please always maintain a 4:3 aspect ratio when resizing. For best results, work with your webmaster to insert the widget. HEIGHT="167" BORDER="0" ALT="Reducing Risk From Radon: Information and Interventions"